The 85mm f/1.4 Lens for Sony E Mount from Rokinon is a manual focus, manual aperture, telephoto prime lens compatible with full frame and APS-C format Sony NEX mirrorless digital cameras. On APS-C format cameras it provides a 35mm format focal length equivalency of 127.5mm. It is ideal for portraiture and other telephoto applications. Its bright f/1.4 maximum aperture is very effective in low light situations and provides shallow depth of field focus control. An aspherical lens element aids in the reduction of aberrations and UMC multi-layer coating minimizes flare and ghosting and contributes to overall sharp imaging. The lens offers a minimum focus distance of 3.3', its filter thread diameter is 72mm and included with the lens is a bayonet-type lens hood that deflects unwanted light and protects the lens from damage. Box Dimensions (LxWxH) 6.3 x 5.1 x 5.0"
85mm f/1.4 AS IF UMC Lens for Sony E Mount is rated 4.4 out of 5 by 29. Rated 5 out of 5 by Anonymous from Great for the price. Is it the best lens in the world? Probably not. Is it a great lens for the price? Absolutely.I use this lens with a Sony A7s. I wanted a fast lens that was all manual and didn't require an adapter, this fit the bill and the price was right.I keep my Zeiss 35mm lens on my camera 90% of the time, but throw this one on for portraits or generally anything I want to look hyper-pretty. Bokeh is nice, and focus ring is really smooth. The only thing about this lens that bothers me is the weight, but I'm probably just a wuss. Okay, I'm for sure a wuss. Rated 5 out of 5 by JohnA from Better than Zeiss! The Rokinon 85/1.4 is a very SHARP lens! Sharper than my Contax Zeiss C/Y mount 85/1.4 MMJ. The Rokinon has a little bit of glow at f/1.4, but at f/2 it's completely gone and becomes very contrasty. The Rokinon also has very nice, smooth out of focus areas and bokeh. My only nitpick would be some CA and LoCA (purple and green fringing) on very bright edges at wide apertures, but this seems to clean up easily in LR. FWIW, the Contax/Zeiss has plenty of glow at f/1.4, as well as a little CA and LoCA. The Rokinon feels and performs like it should cost 2 or 3x the price. Great value! Rated 5 out of 5 by BradZChef from Great Portrait lens This is a really nice, sharp lens for my Sony A6000. It's really fast, really sharp and easy to use. I do have to remind myself that it doesn't have the OSS (image stabilization) that my Sony lenses have so I have to shoot higher shutter speeds. This isn't any kind of flaw- just an observation. As others have mentioned the manual focus is really easy when aided by Sony's Focus Peaking feature. I also have the beloved Sony 50mm f/1.8 but I like this lens better for tighter portraits and head shots. I'll use the 50mm for 3/4 and full length shots... I'd say, given the price, don't hesitate to give this lens a try. Rated 5 out of 5 by The Scottiest from Excellent pair with A6000 One word: Fantastic! I love this lens. It is crazy sharp! Even at f/1.4 all the little details are presented very well. Although, it does have a bit of soft glow wide open. Some others say its Soft or Blurry but that's not the case at all. If the Glow is too much for you, a stop down to f/2-2.8 gets rid of it nicely. I use this lens on my Sony A6000 and it performs exceptionally well! I thought focusing would be a problem but surprisingly its super easy! The focus ring is nice and smooth any very precise. A major upgrade from the kit lens. The only thing I could really complain about is that its does produce some noticeable color fringing on high contrast edges. But that's easily fixed in your favorite editing program. Rated 5 out of 5 by Nmagsino from Poor man's canon 85L. I'm not a professional. I loved the 6d and 85L. One if not the best 85mm lens in the world. I'm trying out sony and was looking for a cheaper option. This will do the job for about 6-7 times less the price of the canon. Build quality. Bokeh. Image quality. More than good enough and I am happy with the savings. I've sold off the 6D and 85L. Will use this on Sony a7 and nex6. Because of focus peaking from sony manual focus is a breeze. Try it. Rated 4 out of 5 by TrishN from Handles nicely I was in love with this lens even before seeing the images. I know that's wrong since the results are what matter, but the lens has such a nice feel to it. I've heard many others say this lens is super sharp, but maybe it's my focus technique or I got a soft copy, but this is not my sharpest lens by any means. However, I still love it because it gives great separation and the out of focus areas are lovely. I've heard sharpness isn't everything and this is the first time I've seen an example of what that really means. Rated 4 out of 5 by Copper Mike from Good Lens for the Price, however... This lens is NOT as-shown. If you look at the product photos, the relative size of the lens mount would lead you to believe that this is a compact NEX/Alpha-sized lens, but it's not. This isn't a native e-mount lens, it's an adapted full-frame lens, with all the size and weight that implies; what the photo doesn't show is that the e-mount version will come with an e-mount adapter fixed in place. I don't blame B&H for the misleading product photo, since the picture on the box it came in also fails to show the adapter in place. So, evidently, Rokinon either doesn't know what their own product looks like or they want the buyer to be surprised - as I was - when the box is opened. I didn't enjoy the surprise.All that being said, I had the lens in-hand, so I decided to keep an open mind and give it a fair shake. Though of made of polymer, this lens seems solid and well-made. The aperture ring has firm click stops with intermediate clicks between full f-stops. The focus ring is smooth and well-damped. Mounted on an NEX-6 and using red focus peaking & the focus magnifier, precise focus was easier to achieve with this lens than with the Sony 35 1.8 in either manual or DMF modes.I don't shoot brick walls or test charts, so I can't tell you about barrel distortion or corner sharpness, but as a portrait lens, this lens is a pretty good value for the money. Wide open, it is sharp where it needs to be and the bokeh is smooth. That's a critical feature, because at f/1.4 DOF is very shallow indeed!There is some chromatic aberration wide open along very high-contrast transitions, but it's not too bad and you'll have that to some degree with any fast lens when shot wide open. There's also some discernible bokeh-fringing. It didn't bother me. You can see it in the girl's necklace in the photo attached to this review and decide for yourself if it'd bother you.In the end, it was the size & weight that was the deal-breaker for me. Smaller and lighter is one of the key advantages of mirrorless cameras, and this lens was a big step in the opposite direction as far as I was concerned. I'm cool with adapting lenses to my e-mount - that's another huge advantage of mirrorless cameras, after all - but I'd rather use lenses that are sized and weighted in proportion to the camera body. Ultimately, I returned this lens and replaced it with a Voigtlander Nokton 50mm f/1.5 in Leica M-mount, adapted with a Voigtlander VM-E adapter. Of course, that's a LOT more money. If you want a decent manual portrait lens for not-too-much money, and the DSLR-level size & weight don't put you off, this is a pretty good lens. Rated 4 out of 5 by Marsha from Heavy in weight but gorgeous DoF. This lens was heavier than I was expecting but well made. The weight alone feels like the same as my camera with the Sony kit 28-70mm kit lens attached! The DOF is super nice and it took me awhile to get used to manual focus but once you get the hang of it, the results are very pleasing. This will be a very nice portrait lens and I can't wait to try it outside as well. Just how 'manual' is this lens? Is it a throwback to the days when you had to fully open the aperture, focus, then close the aperture, then shoot the picture? Will the lens at least automatically stop down to aperture I set when I trip the shutter? Yes the lens will close down to the aperture that you set. I find this lens to be a great choice I love it. if this lens does not have electronic components does that mean if you put it on a Sony a7/a7r body it shouldnt have a apsc crop? I'm a little confused about what dpreview's article saying how rokinon has 2 new lens for the Sony FE mount. And this was linked to this lens. The image will not be cropped on an a7 or a7R; though this has nothing to do with the lack of electronics. The Rokinon 85mm f/1.4 lens for Sony E mount is a full frame lens, so its image circle will cover the entire sensor of a full frame E mount camera. How the chromatic aberration in this lens afects the Black &amp; White pics? I have not had any issues with chromatic aberration in my B&amp;W shots that I have noticed. Lightroom doesn't have a lens profile for this lens, but I will sometimes use a Nikon 85mm lens profile instead. If you look on Flickr, for example, they have a group for this lens where you can check out samples. Hi B&amp;H team,i want to buy this for the NEX6. (1) Does this work as is on the NEX or is there a build in adapter(2) Is this full frame or normal APS-C lens format ?Thank you!! The Rokinon 85mm f/1.4 Lens for Sony E Mount would be compatible with the any E-mount camera without the need of an adapter, including the NEX-6. This lens can be used on both Full frame and APS-C size sensor E-mount cameras. Is it a metal body or plastic? I'm assuming I'll get a preview of the exposure in the view finder on my a7II? What you see through the viewfinder is what you get. 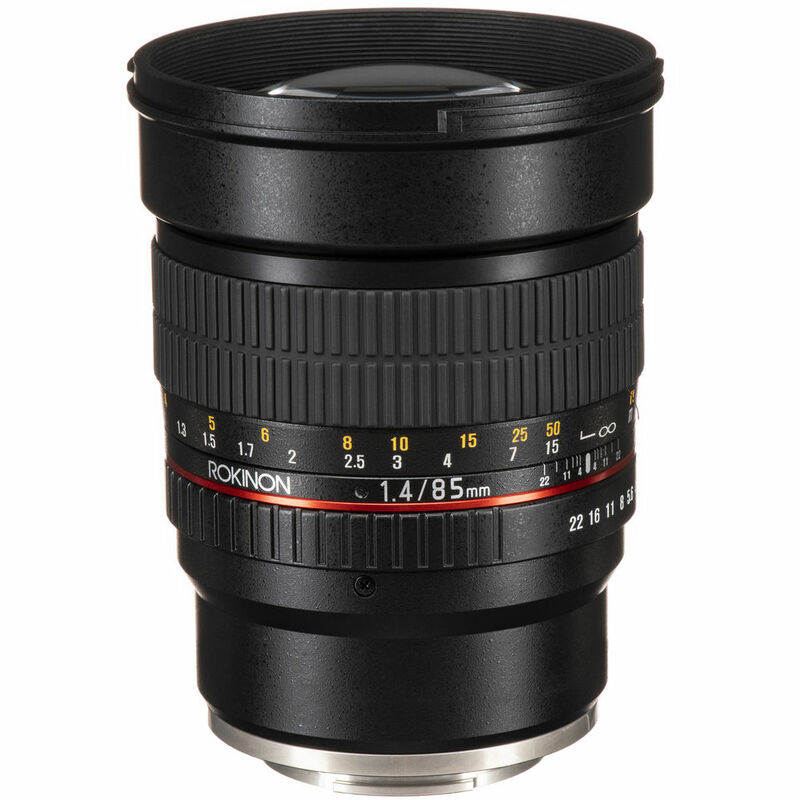 Are these Rokinon lenses Full Frame lenses or will they be cropped on the A7/r? The Rokinon 85mm f/1.4 lens for Sony E mount is a full frame lens, so its image circle will cover the entire sensor of a full frame E mount camera, such as the a7 and a7R. The image would not be cropped. Can i use this lens with sony nex vg20? You can use the Rokinon 85mm f/1.4 AS IF UMC Lens for Sony E Mounton the NEX-VG20, yes.